Last summer I decided I needed a new hat. I had misplaced my NRA ball cap and wanted a wide brimmed hat for the hunting season. My wife and I went to the local Bass Pro Shops, it is less than 20 minutes away, and I tried on every hat they had. My wife seemed to think all of the cool hats were dumb, so I sent her to look at women's clothes. This lead to her spending more money at Bass Pro than I, which is actually very common. Apparently the girls clothes are quite nice there. It was a hard decision, but I ended up choosing a hat made by Dorfman Pacific. Boy am I glad I did! This hat has become my all time favorite! Comfort - I dislike hats to begin with, so if I'm going to wear one it has to be comfortable. This Dorfman Pacific hat is probably the most comfortable hat I have ever worn. It is like wrapping your favorite blanket around your head, without the heavy, hot blanket feeling. The mesh top keeps your head cool. I've never had a problem with my head getting hot. 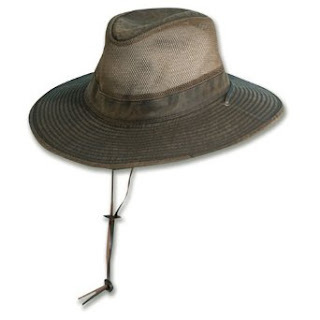 Sun Protection - This hat does a great job of keeping the sun off your head and out of your eyes. You would think the mesh would let the sun in and give you a sunburn, but this has never happened to me. Amazingly, the sun is usually up in the sky and does not shine hard through the mesh. The brim is really wide and has no problem keeping the sun out of your eyes. Rain Protection - The main reason I wear a hat on overcast days is to keep the rain off. This hat does a fair job of keeping your head and face dry. It does great in a light rain, but in heavy rain your going to get wet. Recently I was caught in a downpour. The rain not only made it through the mesh upper, the cotton fabric of the hat got soaked. It was better than nothing, but not good. Fashion - I look awesome in this hat. Hats usually make my head look big. This Dorfman Pacific just makes my head look amazing. I like getting my picture taken with this hat. If you need a comfortable hat for warm, fair weather this is the hat for you. If you are going out in cold, wet weather you may be better served with something else. I personally love this hat. I wish it came in blaze orange so I could wear it during deer gun season. I was not compensated in any way for this review. The item was purchased with my own money. This is my honest opinion. I do get a very small commission if you purchase something from the links below.